Most women understand that it’s not cool to be walking around European cities in big, clunky white sneakers, which is why they love my suggestions for comfy, closed toe walking shoes. But what about sandals? 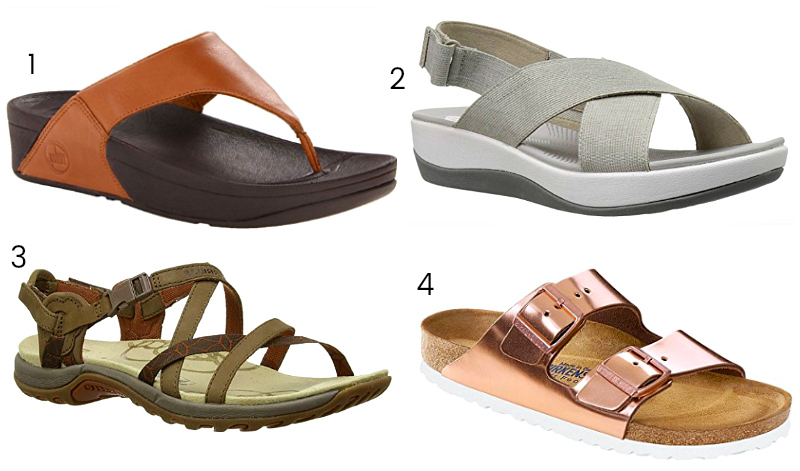 What type of sandals should you pack for your trip that are practical and comfortable, but not boring? Here are some guidelines to on what to look for, plus a look at some of the latest comfortable walking sandals for women in stores right now. Water resistant – Wet, cold feet can ruin your trip. Good for walking on cobblestones, grass, rocks, sand and historical ruins. A strong sole is a must. Practical, stylish and works for night and day outfits. This cool Helen sandal by Mephisto with its chic metallic finish is modern and contemporary. It looks especially hip with a pair of blue or white jeans and a modern top. Sometimes you want a bit of height, but you want the comfort too. So try the Kayla Wedge Sandal by NAOT. With a 1-1/2 inch wedge heel and comfortable sole, this shoe is both chic and easy to wear. (It comes in black too!) One of the stylish sandals for travel, this is the perfect shoe if your travels involve a dressy occasion where you’ll be on your feet. The Teva Original Universal is modern and lightweight. These are good walking sandals for travel because they have an adjustable strap for fantastic fit and durable rubber sole for comfort and wearability. I just had to slip these white wedge slide sandal from Clarks in to my list. White shoes are HOT this summer! Gals are wearing them with everything from shorts to dresses to pants. These give you on-trend styling with the comfort of a quality shoe. Read the rave reviews. These toggle strap sandal from BZEES get rave reviews for being comfortable and great for walking. If comfort is your chief concern, then these may be the sandals for you. This bestselling Sanaa walking sandal perfectly supports and cushions your foot with every step. The unique rocker sole reduces stress on your knees and joints. They’re also cute to boot! These cross strap sandals incorporate Naturalizer’s N5 Comfort Technology. What the heck is that, you ask? In a nutshell, it means extra cushioning to absorb shock, breathable lining so your feet don’t get hot and sweaty, a balanced fit designed for stability, fewer pressure points, and lightweight materials for easier walking. A shoe designed for comfort and in a pretty shade of pink (they come in other colors too), what more could you ask for? The picture of these flat ankle strap sandals from OTBT don’t do them justice. The gold in these brown/gold sandals is muted and neutral and the ankle strap gives you support without ‘cutting’ your leg line. These sandals aren’t just a pretty face – or foot – (LOL!) though. A contoured footbed that supports the natural curve of your foot makes them comfy too. I was drawn to the cute red straps on these ‘Damara’ sandal from ECCO. Wouldn’t they look amazing with white or blue jeans or a pair of casual capris? These shoes are especially good for gals with wider feet. I adore Naot shoes. This brand consistently makes comfortable walking shoes and sandals and their ‘Sabrina’ sandal is no exception. I especially like the black and tan combination of these for summer. They’ll look great with a casual LBD. Previous Post: « Meet My Fabulous After 40 Readers – Style Stars! 29 comments on "Comfortable Walking Sandals for Travel"
I literally just got back from 16 days in Italy where we walked about 10 miles a day. I took all sorts of cute comfortable sandals , even some from this article and NOTHING worked. My feet were so painful, swollen and blistered (yes I broke them in. Even though it was hot I had to buy a pair of white sneakers and socks which I wore with skirts, dresses, anything. I never , ever wear sneakers other than for working out. I thought it looked a little stupid but at that point I just didn’t care. And you know what else? I saw tons of women doing the same thing, including young and old, and even Europeans on vacation. Italians are extremely stylish and there is no way to compete with that. I managed to look like a tourist as much as I tried not to. My advice: wear whatever is best for your feet because no one really cares. next time I go to Europe it will be my white sneakers. There are some German and Austrian leather sandals that are very well made and comfortable by Haflinger and Giesswein. As a European (Danish) native, I just would like to point out that Europe is not a country, it is a lot of very different countries and cultures. Wearing comfy shoes definitely would not make you stand out in Northern Europe. In fact, Ecco is a Danish brand, making high quality comfortable shoes. If you are going to Rome or Paris, you might want to consider more bringing stylish shoes and outfits. Just remember that any holiday in Europe involves LOTS of walking. There is no such thing as a stylish walking shoe, and I promise, everything you showed will make you stick out like a sore thumb in Europe. I know, because I live in Paris. I work as an international flight attendant in New a York and fly….Europe. I wear my awful aerosoles, gram Central is the style, and look like the Mary Janes you showed. Because I wear orthotics and have bunions, I couldn’t take the stares anymore with those shoes . I found Josef Seibel sneakers which seems to do the trick. Wear my designer bags, statement faux jewelry, and hope to offset the comfort look. THAT is what the difference is in dress between Americans and Europeans. Totally right. I don’t think it’s the shoes, I think it’s the clothes. Too many Americans wear too casual, comfortable clothes: Yoga pants, short shorts, cargo shorts, t shirts. I was so impressed by the Italian’s style. The clothes, the accessories, the creativity. I could only hope to dress like them and I consider myself a good dresser. I spend at least 2 months every spring and summer in Europe and the very best shoes are FitFlops. Perfect for cobblestones, perfect for hiking around the hills, perfect for the beach. So many styles to choose from so you can always be comfortable and stylish–and your feet will be so happy! I just moved to London with my husband last fall. I have to say that all my regular shoes from Seattle really didn’t work, except for one pair I got at Macy’s. They are ballet styled with an elastic crossing across the top of my foot, and the brand is Strictly Comfort?? Because of the very uneven walking surfaces, your feet and your legs, up through your hips and into your back really get jostled much more then they ever would in the states. I ended up buying a pair of flat leather boots with a thick sole that I lived in until very recently when the weather warmed. I honestly prefer boots, it stabilises the foot a lot better. On every previous trip to Europe I’ve brought my Dr Martens loafers, and one trip to Israel I wore Clarks Unstructured. I’d rather have comfort over pretty, and I dress with more of an “edge” so heavier looking shoes balance things out nicely. Just got back from Europe last week where we drove through 4 countries & 3 different climate zones. I primarily packed dresses & brought 7 pairs of sandals. Used them all because I had them, but only needed two pairs: metallic sandals & black ballet. The metallic sandals & ballets were comfort shoe brands & perfect for all the different terrains & activities. Also, in place of packing jeans, I packed my black Lululemon pants & paired them with my cardigan set. If you feel the need for running shoes look at Nike Free TR Fit, blk/blk. I went to Europe for 2 weeks last fall, with lots of walking. I learned that any heel, however cushioned, will not stand up to 10 hours of walking! My most comfortable pair I wore was a pair of gold snakeskin Aerosoles flat sandals! My favorite is a pair of sandals from naturalizer. All great shoes. Exactly what European women wear! Merrell is my favorite brand! But I’m going to Europe next month and am still not sure what to wear. I think I need something more than sandals for my flat feet. I love my Arche flats. I just returned from Argentina and wore them everyday. I also have a job that requires standing for 6-7 hours and wear Arche, Born, Jambu and Dansko shoes to work. Very comfy!! But if I remember correctly, sandals may not be appropriate for touring some cathedrals, and you’ll want closed-toe shoes. We’ve never had a problem wearing sandals in cathedrals in Europe, but you must cover your shoulders and arms. It’s good to carry a little scarf with you. I”m currently looking -going to Europe in Summer 2012. Someone recommended Chaco shoes – I like the looks of their sandals but want something a bit more dressy looking. Mine are a pair of Merrell’s but not very stylish but I could walk all of Berlin in them. Better than running shoes. Merrell’s are a wonderful brand and good for your feet, but some styles can be clunky looking. However, we agree, much better than a running shoe! I don’t have a favorite pair of travel shoes; that’s why I need these!! I’m hoping to go to Ireland next year to celebrate 25 years of marriage with my wonderful husband. We never got a honeymoon (we were too broke! ), so this will be a really great celebration. I saw many people on Rick Steves’ travel site recommending Naot brand shoes for traveling Europe. I went with their Nau Mai shoe for all the walking I’ll be doing on cobblestones. Those will be much better looking than a pair of tennis shoes for sure!